Gov. Martin O'Malley addresses Maryland and Indian business leaders. Gathering on a top floor of Baltimore’s World Trade Center with a panoramic view of the harbor, Gov. Martin O’Malley addressed more than 60 business leaders from India and Maryland in an attempt to strengthen trade and investment between the state and the South Asian country. In an interview later, O’Malley also discussed the likelihood of two special sessions for the legislature — one in May to resolve budget issues and another in August to deal with gaming. He also suggested it might be time to create a new gaming commission to regulate gambling in the state. 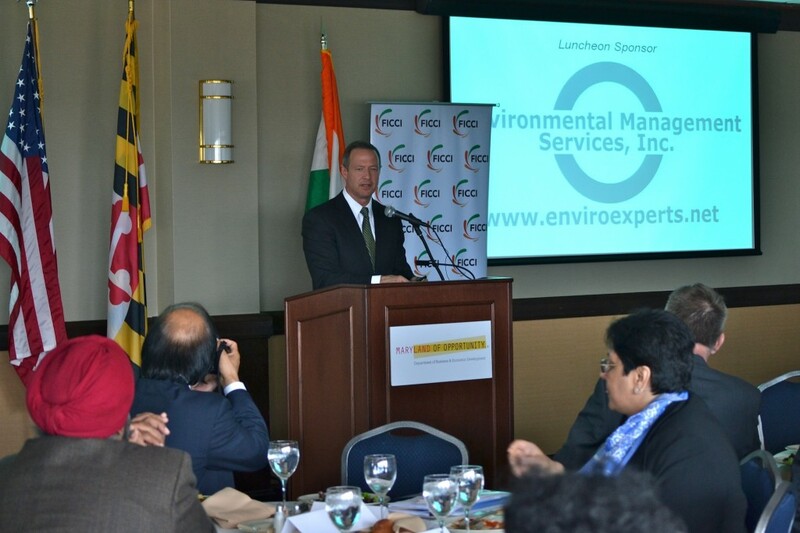 At the luncheon, O’Malley said innovation and job creation were choices that Maryland and India were making together. The governor touted a 70% increase in trade with India over seven years and the fact that Maryland has the largest number of Indian-American state lawmakers in the country, with three state legislators. The event came four months after O’Malley’s historic trade mission to India in December 2011, which helped secure about $60 million in new business deals. The trip was the largest foreign trade delegation in state history and the first to India led by a sitting Maryland governor. O’Malley said from the state’s beginning the port had been the center of trade and commerce. “We, from our founding, having always been engaged with our neighbors from around the world,” O’Malley said. Baltimore was the gateway to doing business in the U.S.
O’Malley arrived at the luncheon after a breakfast meeting in Annapolis with Senate President Mike Miller and House Speaker Michael Busch intended to resolve issues surrounding an expected special session. The meeting with Miller and Busch seemed to be on O’Malley’s mind. He twice alluded to the legislature’s failure to approve the entire budget package two weeks ago. Speaking to MarylandReporter.com after the event, O’Malley echoed comments he made to reporters earlier in the day, stating that a special session to resolve the budget would likely come in mid-May with a second special session following in August to resolve issues surrounding table games and a new casino in Prince George’s County. O’Malley added that he believed there was a growing sense that the state should have a gaming commission of experts meant to deal with the necessary studies and analysis on issues related to gambling, much as there is a Public Service Commission assigned to deal with utilities. According to O’Malley, the legislature would have until Aug. 20 to approve gaming legislation in order for it to make it onto the November ballot for final approval by voters.